“Why do we fall?” This is one of those lessons no one tells you that you will have to teach as a parent. You expect to teach buttons and fasteners, letters and numbers, and riding bikes and driving cars. You don’t expect to teach the art of falling. They are sort of like Buzz Lightyear. At first they are convinced they can fly. 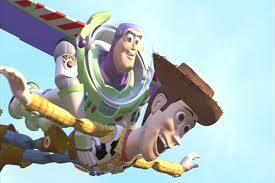 Buzz full of faith, eager to prove to Woody he can fly, climbs to the tallest point, shuts his eyes and jumps. see Buzz Fly He’s never experienced a fall. With his eyes closed he doesn’t see all the objects that break his fall as he lands upon a bed and proclaims, “Can.” This is how my kids started out. No doubts, no real questions of disappointment or fear and they would just leap. But like Buzz, they begin to notice those around them and listen to their opinions and judgements. Buzz puts himself to the test again. This time voices of others are in his head reminding him of his limitations and his eyes are open. He finds another tall point and jumps. This time, he keeps his eyes open to see for himself. He lands hard and is broken. See Buzz Fall This is where my sons find themselves now. Their eyes are open, they are questioning everything, they are cautious and easily dissuaded from their pursuits. They are having their first real taste of frustration. They worked really hard on a project all year to compete against other state schools in a Lego Robotics competition. Not everything went according to plan and their team just missed being selected to advance to the next level. They were part of a soccer team that just couldn’t seem to win a game no matter what. Schoolwork is getting harder and some grades that came home weren’t the kind that go on the fridge. These are their “voices” these days and the prospect of falling short has entered into their personal calculus. You start out with, “It doesn’t matter if you win or loose.” Every parent has said this and we all see the same look we gave our own parents when we heard it; one of utter dissatisfaction. I have started to go another route. One that I learned from Woody. It focuses on teaching them that anything worth doing well, is worth the bruises along the way to get good at it. It tries to have them take the lesson learned and mold it into one more tool to put in their tool box for the next time. It points out, that the expression isn’t, trial and success, it’s trial and error. Success comes to those who continue to get up and go, who don’t give up. Most importantly, it let’s them know that win or loose, recognized or not, their worth is not anchored to any of it. It isn’t even anchored in their parents who love them unconditionally. It is anchored in God, who made them, who is for them, who has plans for them, who will complete what he started in them, who doesn’t ask them to compete or to qualify. As Woody is trying to cheer Buzz up, he says, “ Look, over in that house is a kid who thinks you are the greatest, and it’s not because you’re a Space Ranger, pal, it’s because you’re a TOY! You are HIS toy.” Andy becomes a symbol for God. We are God’s like Buzz is Andy’s. At the end of the movie, Buzz has come full circle. He is ok with not being a Space Ranger and realizes being Andy’s toy is worth more than any mission to save the universe. The next time he falls it is from the highest point he’s ever reached. Buzz falls again with his eyes open, but this time he embraces the fall and keeps his eyes on the car where Andy is riding. At the end, he finds himself and Woody reunited with Andy. See Buzz Fall With Style That’s the goal for all of us. When we find ourselves at a high peak and we begin to fall, no need to try and fly. Open your eyes and ride the current with confidence, keeping your eyes fixed on God. With practice hopefully you learn, like Buzz, how to fall with style. I am not much of a sports enthusiast, unless you are talking about my alma mater, Va Tech. Then I will don orange and maroon and scream at the television until my throat is hoarse. So, I wasn’t very enthused when I found my husband one night watching a baseball documentary. I came and sat beside him hoping it was almost over. Well, my husband left before it ended and I, surprisingly, became engrossed in the story of Steve Bartman. He is a life-long fan of the Chicago Cubs, who during a play-off game in 2003, reached for a ball and is subsequently blamed for: 1: keeping the out-fielder from making the out, 2: the Cubs losing the game and, 3: ultimately losing the series that keeps the Cubs from playing in the World Series. In an instant he became one of sport’s most famous scapegoats. Ash Wednesday begins this week and I am struck with a larger message of blame, repentance and atonement. The word scapegoat, or ‘azazel’ in Hebrew, is only found in Leviticus 16. Here God gave instructions for what would become the holiest of days for the Jewish people, Yom Kippur or The Day of Atonement. Yom Kippur takes place ten days after Rosh Hashanah. On Rosh Hashanah, Jewish tradition holds that God reviews the names written in the Book of Life. The faithful have ten days, known as the Days of Awe, to repent, pray and perform good works before their fate is sealed for the year. As part of the Temple service on Yom Kippur, a sin offering of two goats was made to God. The High Priest would cast lots over the goats. One goat would become the blood offering for the atonement of sin. The High Priest would lay his hands on the head of the other and confess the sins of the people upon it. A red cord was tied to the goat’s horn and it was banished into the desert wilderness. 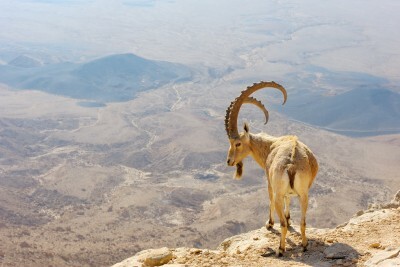 The Talmud tells of one goat’s return to the city and from that time forward, the scapegoat was led to a desert cliff and pushed to his death to ensure the sins it carried could not be brought back to the people. As I watched how unfairly Steve Bartman’s life changed because thousands heaped the blame of loss on his head, I asked what could I learn about my sin and my blame as I enter Lent. Secondly, like Cub fans try and blame Mr. Bartman, we often try laying our decisions on others and hope that they will carry them far away from us. However, Jesus tells his disciples in Mark 7: 20, “what comes out of a person, that is what defiles.” St. Bede added, “This is an answer to those who consider that evil thoughts are just injected by the devil and that they do not spring from our own will. He can add strength to our thoughts and inflame them, but he can not originate them.” (Exposition on the Gospel of Mark) None of us can say, “The devil made me do it, or Mr. Bartman, or whomever”. Lastly, although Jesus stands eternally in God’s presence as the sacrifice for sins, I must be his partner. Just like the High Priest confessed the sins upon the scapegoat, I must admit my guilt, present my sins to him and ask that he be my substitute. He doesn’t coerce his gift on us. We must ask to receive it. In Exodus 32 after Moses sees the false golden idol the people made, he asks God to “strike me out of the book you have written” as atonement for Israel. (Ex 32: 32) God refuses Moses and replies, “Him only who has sinned against me will I strike out of my book.” God has warned us he edits the names. I prefer my name be written with the ink of Christ’s sacrifice instead of with my own wavering hand. So this Lent, come to the Rite of Reconciliation, admit your guilt, confess your sins to Christ that he might banish them to a desert place and highlight your name by joining it to Christ’s sacrifice. My eldest asked, “Mom, can the devil and demons kill us?” “%$&#!”, is what my inner voice said, but I responded, “Where did that question come from, honey?” His religion class had watched a video and it mentioned the Catholic Rite of Exorcism. It got him thinking about what powers do demons have? I asked what the video said about exorcism. My son replied, “That it is rare, that it is done by a priest, and that it involves prayer.” Now, my knowledge on things demonic is very limited and I mostly considered that a good thing until just this moment. I started with a confession, I told my son that I didn’t know much about what demons can and can not do but, I would share what I did know. First, demons are real. They were not created evil. 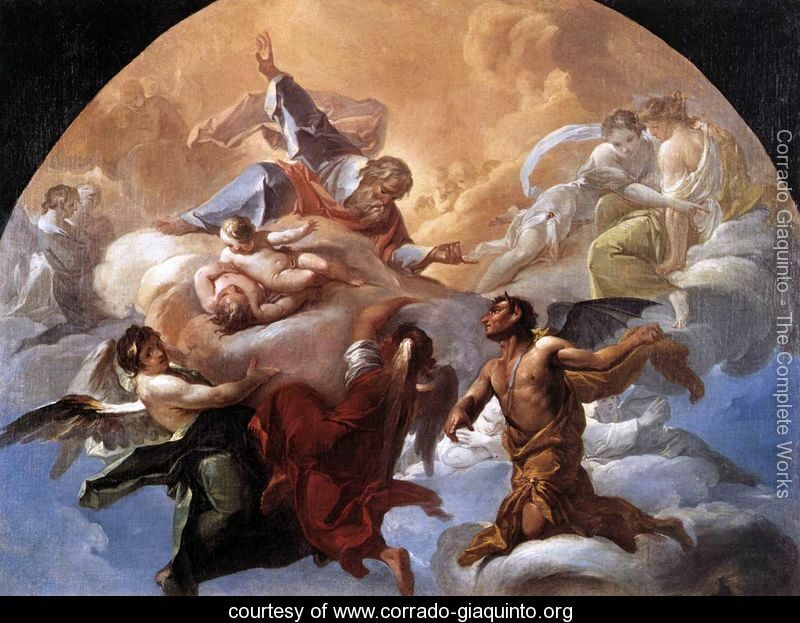 Revelations (12: 7-9) tells us that after God created angels there was a testing before admitting them to the Beatific Vision, the sight of God’s very essence. God did this because like us, angels have free will. God wants a relationship of love with the beings he creates and love can not exist without freedom, it needs to be received and given openly. Some angels wanted to use their freedom to be free of God. (Jer 2:20) In the same way, some people use their freedom to try and free themselves of God. Second, evil exists but not on its own. Evil is the absence of love, just like darkness is only the absence of light. As well, like light, it’s variegated. It ranges from the complete absence of love to moments of pride or hate or selfishness or anything that is contrary to love. Love is freely willing the good of the other. Freely means without thought of how it may benefit or impact me. The moment you think, “If I do this, it means I will get….” (fill in the blank: an award, praise, money, pride) you begin to narrow the straw through which love is trying to flow. If your reason for doing an act of kindness is about how it will help you in some way, then the act isn’t really an act of love, it is an act of self-interest. Love is infinite because its source, God, is infinite. It has no limits. Evil, however, is limited in its power and its scope because it exists only through the actions or inactions of people or demons. Both people and demons are finite. Both have limits. In the battle of Love vs Evil, Love wins every time. Period. Lastly, “Perfect Love casts out fear.” (1John 4:18) Those angels who rejected God, who have made themselves demons want to convince the world to also try and be free of God. They want to prevent God from having a relationship with his creation. I speculate that just like God told Satan, he couldn’t take Job’s life (Job1:12), demons are limited in how they can act. They are limited because God made them with limited abilities and because he also restricts how they can use the abilities they have. If they weren’t, things would probably look worse than they do today and in the last days, Revelations tells us, it will be allowed to get worse. (Rev 20:7) I also speculate that for those who have not rejected God, causing our death doesn’t give fallen angels what they are after. I asked him, “Instead of keeping us from God, what would it do, Kevin?” He replied with a question, “It would send us to heaven?” “Yep, it would shoot us right to the very thing it is trying to prevent.” I ended with saying you have the whole armor of God (Eph 6:11), you have Guardian Angels (Psalm 91, Matt 18:10), you have within yourself the Holy Spirit (1Cor 3:16), you have the promise of Easter (John 3:16) and there isn’t any evil that can overwhelm that. You radiate such light, that evil dissipates. You don’t need to worry about fallen angels. There weren’t any follow-up questions. I think he felt he had enough to chew on before he took any more bites. I thought, when I get home, I have to get more knowledgeable on this. I read a fabulous little book, Interview with an Exorcist , by Father Hose Antonio Fortea. He answers 110 questions about demons in a way that is easy to read, with references to scripture, some saints and personal experiences. The second book is where I found the image above, Meditations on Vatican Art Angels, by Mark Haydu, LC, STL. He chooses several pieces of Vatican Art, pairs it with scripture and a short commentary. I recommend both. You know the day will come when a child asks about Santa. How does he get around the world so fast? Why does he look different at all the malls? How come he does things differently at my friend’s house? My friend says that his parents told him Santa isn’t real? This is when you know it’s time to invite you into the Christmas Club. It is open to all who accept and believe. Although he tried his best to remain anonymous, eventually those he helped, who wanted to thank this secret benefactor, discovered Nicholas’s generosity. He went on to become a bishop of his home at a very young age and after his death was recognized as a saint. Even in death, God enabled him to continue to give. The marble of his tomb weeped oil that would heal those who were sick. Tales of his generosity and love for Christ spread quickly throughout the known world. The Church began to celebrate his feast day on December sixth and people would secretly exchange gifts in honor of the saint who tried to love the way God commanded. December was also the time Christians celebrated the birth of Christ. They noticed the gifts the Wisemen brought to honor Jesus. They saw Nicholas and how his gift giving flowed from the same Holy Spirit that guided the Wisemen to follow the star with faith and give generously to the Lord once they found him. It was the fruit of the Holy Spirit: love, joy, peace, forbearance, kindness, goodness, faithfulness, gentleness and self-control. Christians began to let the Holy Spirit work through them and follow the example of Nicholas to love one another on the birth of Christ. But, how to do this anonymously? Because Saint Nicholas never sought credit for his generosity during his life, the Holy Spirit would guide Christians to give it to him after his death. 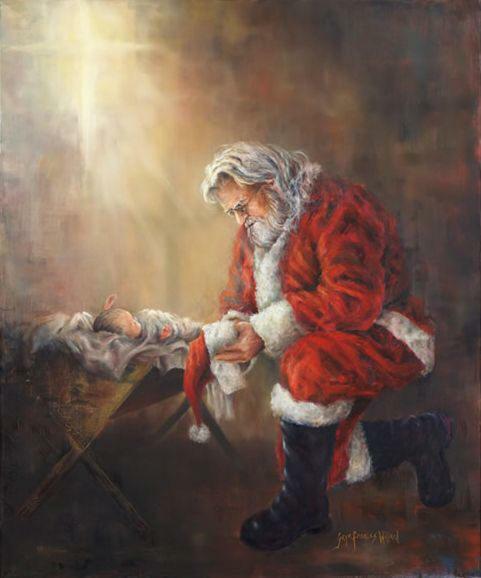 Santa Claus (St. Nick) would bring the gifts to all of God’s little ones, God’s least ones. God would bless this outpouring of love and generosity, he would do it on a global scale, and more than 1000 years later it would continue to grow and flourish. Santa shows you, as a little one, the unconditional generous outpouring of love in celebration of Christ’s birthday. Children are lavished upon as we would want to lavish thanksgiving upon Christ. Our gift to him, is our love and generosity to one another. In order to love Jesus, you must first meet him. In order to give his love to others, you must first receive it to the point that it is overflowing. Joy is contagious. The fact that St. Nicholas’s example of joy and love for Christ has spread throughout the world and has survived for over a thousand years can only be explained if God is it’s source. Now, is the amazing part. Now, you are invited to join the millions of us who give as Saint Nick. You are invited to become, just like St. Nick, Jesus’s hands and feet, by giving to others around you. You are asked to begin to pour out the love you received onto others. You are asked to keep the secret so all those little ones still get to experience the wonder of God’s love and generosity through Santa. You are asked to become a true Secret Santa to all those whom your life touches. If you say yes, you will see that we Secret Santas have the better part. The first time you see your giving fill someone up with joy, you realize it is better than any gift you have ever been given in the past. So yes, Santa is real, his example continues on through the Holy Spirit that resides in each of us. He is an example of how to make your life like a mirror, always reflecting the love of Christ onto others. He is more real now than when he walked the earth. The Holy Spirit connects us to him and all in the great Communion of Saints. That is why we say at Mass the great Gloria. Those wonderful words the angels and a multitude of heavenly hosts proclaimed at Jesus’s birth, “Glory to God in the highest and on earth peace to people of good will.” If you say yes, like the boy in the Polar Express you’ll find that the bell will always ring for you, like the grinch your heart will grow three sizes, like Scrooge you will keep the (Holy) Spirit of Christmas, past, present and future in your heart throughout the year, and like St. Nick your giving will inspire others to give. The Naval Air Station here in Meridian hosts a Freedom Fest every Fourth of July. This year’s was hot but great. Lots of bounce houses, live music, cheap beer, cheap food and free non-alcoholic beverages. The fireworks were amazing. They were close and huge. They lit up the sky and to see them reflected in each of my sons’ eyes was just amazing. We arrived early so my boys would have time to make the rounds of the all the festivities. This year they added a zip line that was at least two stories off the ground. My oldest son isn’t crazy about heights. He also isn’t crazy about the fact that there is something out there that makes him uneasy. To add salt to the wound, his younger brother doesn’t happen to share this uneasiness about heights. He asked permission to do the zip line with his friend. A little while later, he was back, eyes red and sour mood. “I couldn’t do it,” he said. At first I thought maybe it was a height or weight thing, or maybe he was too young? “No, the guy said you had to hold onto the bars and not to let go or you could get hurt. My hands were soooo sweaty I knew I wouldn’t be able to hold on.” I told him to have a seat, get something cool to drink and then go with his friend to do the other games. When his friend returned, Kevin’s mood had gone from sour to unconsolable. I told his friend to go on without him and maybe he’d catch up later. After about 10 minutes, my reserve of patience was gone. “Look, Kevin…LOOK around. There’s a game station, a rock climbing wall, several bounce house mazes and lots of other things to do. You’re missing it. You made a decision not to do the zip line. That is ok. Don’t let it spoil your night because there is a lot of time left. You can spend it sitting in a lawn chair or, you can spend it with your friends having fun.” Ten minutes later after sitting in silence and taking in all the laughter, and music and feeling the high energy, he did get up and rejoin his friend. A few weeks later we took the family to a water park. I let my two older boys go stand in line for a water ride that shoots you down a big dark tube, spits you up a big wall, only to let you come back down backwards before coming to a stop. A little while later there was Kevin, “Mom, you have to go with Ryan. We can’t go together. We don’t weigh enough. You have to weigh 140 lbs together and we don’t.” I left Kevin, made my way up the line to find my middle son. Ryan and I did the ride. The whole time I was beaming with pride. My older son had actually given up his spot willingly for his brother, no tears, no fights…nothing. I AM A GREAT MOM!!!! It was a mountain top moment for me. But just like Moses, when I came down the mountain, I found my older son, eyes red and sour mood. “Now, I can’t go.” I told Kevin we could go and get in line. I would do the ride again. “No, it will take too long. I don’t want to wait. It’s not fair that Ryan got to do it.” This time I didn’t have any patience in my reserves. While this had nothing to do with heights, I couldn’t help but see a pattern. “Kevin, again YOU are making a decision not to do the ride. We can go and do it. If you don’t want to that is fine. I am so proud of you. You did a very nice and selfless thing by giving up your spot so I could go with Ryan first. But, nothing is stopping you from doing the slide right now. LOOK at all the people around us. They are smiling and laughing and having fun. We have a lot of time left here and just like the Freedom Fest, it would be a shame if you waste it because of one ride. What would you like to do?” “Nothing,” was his reply. So he followed me back to where my youngest was playing with my husband, upset and determined to keep his sour mood. Monseigneur Suns gave the homily at our mass the other day. He used to be the pastor at our church and he commented on how many of the once small children he knew can now look him in the eye. I could appreciate that as my nine year old is now at my chin and I know all too soon, he will be looking at me eye to eye. He told a story of a Rabbi. The Rabbi had noticed that a member of their community had stopped coming to synagog. He decided to visit this person at their home. He knocks and is invited in. He takes a seat in front of the fire that is burning in the fireplace and the man he is visiting sits in a chair next to him and offers the Rabbi a drink. They sit in front of the fire without any words. The Rabbi takes the poker from the hearth and pulls forward one red hot ember from the fire. As it sits on the hearth it begins to cool and turns from bright red to black. Neither say a word as they watch the lone ember. Once the ember has cooled, the Rabbi reaches for the poker again and pushes the ember back into the fire. Both men watch as it catches its glow again and burns a bright hot red. The man looks at the Rabbi and says, “I will be in Synagog this week.” The Rabbi gets up, pats him on the shoulder and leaves the man’s home. Before I heard this sermon, I liked this response to, “Why church?” Now, I think the Rabbi has the more compelling argument. God himself is a mystery of being one, yet in a community of three. We are made to be in a community. We as Catholics understand that in the body of Christ, we are given the great gift of the communion of saints. We know that this communion extends to heaven. When we come to mass, we are joining with a heavenly counterpart. We are celebrating with the communion of saint and all the angels. Several times in the mass we mention this connection. At the Penitential Act, at the Sanctus, and at the Eucharistic Prayers. The simple truth is that we normally don’t come to faith by ourselves, it happens within a community of people who have touched our lives and shared their faith. This faith of ours is Love, it is a contagious joy. A contagion needs to come into contact with a host if is to survive. You need to touch other people. Church is the way to keep ourselves filled with faith to then go and spread it to others. Left in a self-imposed quarantine our faith, having no where to go, will die. The next time one of my sons asks me, “Why do we have to go to church today?”, I will use the image of an ember returning to God’s bright fire to become red hot. I think I will tell him, “It is time to go get our glow on.” In fact, one of my favorite passages from the bible is in Daniel 12: 3 (New Jerusalem Bible) “Those who are wise will shine as brightly as the expanse of the heavens, and those who have instructed many in uprightness, as bright as stars for all eternity.” That is what I want to be, an eternal ember. Not one that is cool and dark, but one that shines as brightly as the expanse of the heavens. I love my Pastor. Father Frank is seventy-one, in Mississippi with his Irish brogue accent, plays racket ball and gives a great homily. Recently the Gospel was Jesus bringing Lazarus back to life. It is the season of Lent and we turn to Jesus performing one of his greatest miracles. I have always thought of it as a “minor” resurrection. A foreshadow of Christ’s “major” resurrection, that is until I heard Father Frank’s homily. He started by noting how numerous the accounts are of people who have died and come back to life. In fact, if you haven’t read 90 Minutes in Heaven, it is on this exact topic and is a fabulous read. People see different things, some a light, some loved ones, some see heaven itself. They all however, feel the same thing: content, happy, fulfilled and complete. They don’t want to go back. Afterwards, they all also say they no longer fear death. There in lies the key, they all will experience death again. So, too would Lazarus. While Lazarus was dead for four days when Christ opened the tomb and yelled, “Lazarus, come out!”(John 11: 43 NAB) and most others who have had these experiences have only moments, they all will come to a day when they will take their last breath in this life. While we don’t have the account of Lazarus’ death in the bible, we know it happened. Father Frank pointed out that having to meet death again makes Lazarus’ miracle completely different from what Jesus did Easter Sunday. Lazarus was a “major” resuscitation, not a “minor” resurrection. These are the moments I love. The moments where Christ asks those around him to share in his miracle. Come help resuscitate this man. If it hadn’t been for Father Frank, I would have missed it. If those around Lazarus hadn’t unbound him from his burial garments he would have suffocated within minutes. Father asked a great series of questions. If Christ asks us to help in freeing those who are bound, then who in your life can you free? Who can you give the amazing gift of resuscitation? Who can you forgive? Love? Comfort? Count a debt paid in full? Father Frank went on to ask what has its tendrils wrapped around you trying to suffocate you? From what do you need to be freed? This Easter he asked the congregation to spend some time in prayer on these questions, ask for Christ’s breath of life and take steps to start to breathe life into others. A Mother's Epistle by Sheree Krause is licensed under a Creative Commons Attribution-NoDerivs 3.0 Unported License.